The courthouse is located at 901 North 9th Street, Milwaukee, Wisconsin 53233. NOTE: These photos are of the south side of the building, adjacent to West Wells Street / U.S. Route 18, between North 9th Street (to the east) and North 10th Street (to the west). The building, and the grounds that surround it, are huge! The property is listed on the National Register of Historic Places: Wisconsin, and the State Register of Historic Places. Monumental in scale and austere in spirit, the Milwaukee County Courthouse is a massive neoclassical structure, built of polished limestone blocks, dominated by a colossal Corinthian colonnade, and dramatically perched on a low hill overlooking the Milwaukee Civic Center. Situated on the west end of the main axis of the center, facing the Milwaukee City Hall (NRHP, 1973) a half-mile away, the county courthouse envelopes a steel-framed, multi-story skeleton in an imposing rectangular temple, constructed with over 36,000 limestone blocks and composed of three major horizontal elements (in strictly academic fashion). The rusticated base of the courthouse rises three stories with an arcade of round arched openings punctuating the ground story and two levels of mezzanine windows piercing the wall above. Resting on top of the base and separated from it by a pronounced stone course, Corinthian colonnades rise several stories as they warp around the entire building. Framed at their corners by Corinthian pilasters, the colonnades are composed of carved capitals. Behind the columns, ornate metal grills cover the windows. A band of ornametal carvings at the capital level decorates the solid sections at the corners of the colonnades. Above the columns, a fully embellished entablature, with denticulated cornice, inscribed frieze, and carved wreaths, is in turn, surmounted by a massive parapet which crowns the building, complete with denticulated cornice and ornate cresting. Although essentially a rectangular block, the building features central pavilions on all four sides, projecting outward (and rising slightly above) the main facade, serving to break flat surface, heighten the depth of the composition, and strenghten the imposing character of the building. The arcaded round arches on the ground floor light a dramatic interior lobby with vaulted ceilings and groined arches, trimmed with travertine and Italian marble. Ornamental globes hang from the ceiling and illuminate the space. In the courtrooms above, the murals of New York artist Francis Scot Bradford, executed at the time of construction, depict heroic and allegorical scenes. Occupying an entire block in the center of the city, and looming above its immediate neighbors, the courthouse is a major visual landmark in the area. A recently constructed courthouse annex across the street is connected to the main building by a walkway, but not included in the nominated property. The most monumental of all Neoclassical courthouses in the state, the Milwaukee County Courthouse is perhaps the apogee of the Neoclassical movement in twentieth century civic architecture in Wisconsin. Widely recognized as a masterpiece for its gigantic scale and academic grandeur, the building was hailed by architectural historian Richard Perrin as "the last of the important Wisconsin buildings in the great classical resurgence," (1) and scholar Henry-Russell Hitchcock declared it the "grandest American example of twentieth century classical design." (2). Designed in 1929 by Albert Randolph Ross of New York (whose previous designs included the Milwaukee Public Safety Building) the courthouse took three years and over 7 milion dollars to complete, (3) and was hailed at its construction as "one of the finest public buildings in America." (4). Nominated at the state level of significance as an outstanding example of its style, the building is an enduring tribute to the imposing scale and spirit of the Neoclassical movement. A historically significant contribution to the City Beautiful movement in Wisconsin and a pioneer effort at regional planning, the Milwaukee County Courthouse was the product of two decades of concerted effort by government leaders, urban planners, and private civic associations to construct a courthouse at once a tribute to the "progressive" philosophy of the planning movement and a monument to the City Beautiful aesthetic. 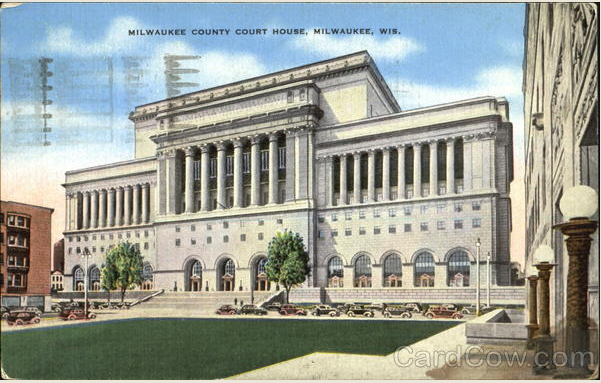 The construction of the new courthouse was far more than another administrative building: as the keystone in the emerging Milwaukee Civic Center, wrote the Milwaukee Journal, it was the "signal of a new epoch in Milwaukee," the dawning of a "well-ordered, well-conducted civic life." (5). As early as 1909, the Milwaukee Metropolitian Park Commission proposed the grouping of all city and county government buildings in a monumental civic center to be bounded by 9th, 4th, Wells, and State Streets and pierced by a widened Kilbourn Avenue. (6). Citing the precedents of European and American cities, the plan was quickly endorsed by such noted planning experts as Frederick Law Olmstead, John Nolen (who called the plan "admirable" and likened it to the Capitol at Washington D.C.), and Werner Hegemann. (7). But the greatest impetus for adoption of the plan -- in spite of county and city disagreement - was the forceful leadership of Charles B. Whitnall, who was appointed by socialist mayor Daniel Hoan as head of the new city planning department. (8). While the city and county remained at odds through 1919, pressure from Whitenall, the Milwaukee "Journal," and such civic groups as the prestigious City Club -- all advocating the cause of enlightened and orderly city administration -- brought the issue to a public referendum. The electorate overwhelmingly approved the concept in April 1920, and the Journal reported the dawning of a "new epoch." (9). But if the courthouse was to symbolize a "well-ordered city," its construction history was anything but orderly. Although the county board appropriated money for a site and building in 1920, and the city followed the lead with a bond issue in 1924, (10) disagreements and controversy beset the project for years. Some of the argument concerned the west-side location -- all previous administrative offices were east of the Milwaukee River -- and a 1925 referendum rescinded voter approval of the plan. (11). But with money already raised, and a court order to proceed with the project, the county and city finally engaged in their tentative attempt at regional planning, agreed upon a site and began construction of the center. Thirty-three architectural plans were submitted in a nationwide competition judged by noted Milwaukee architect Alfred Clas and over 7 million dollars were appropriated for the construction of the Albert Randolph Ross design. (12). Although the courthouse was to be the pivotal element in the new civic center, it was not the first constructed. The University of Wisconsin Extension Building was completed in 1928, followed the next year by the widening of Kilbourn Avenue, and in 1930 by the construction of the City-County Public Safety Building. (13). Nevertheless, when the courthouse opened in 1931 it was hailed by local observers as among the "finest public buildings in America." (14). Looking back on the early foray into regional cooperation, Mayor Hoan decried that "citizens and our county board had battled for twenty years to settle the problem of when, where, and how to build a courthouse costing about eight million dollars. (15). As its construction dragged through the early years of the Great Depression, critics charged that its construction was faulty and its material second-rate. And, after two decades, the style even seemed to be a remnant of a faded era. The courthouse, said Frank Lloyd Wright, "will set Milwaukee back fifty years from every cultural standpoint." (16). Nevertheless, its completion in 1931 signaled an important step in the growth of regional planning (an issue that would constantly surface in the twentieth century history of Milwaukee) and, looming above the civic center, the building stands as a bold tribute to the ideology of the City Beautiful movement. Milwaukee County Court House, Milwaukee, Wis.